The Repairing work for the Maliya bandha is on its way, so that before the Floods (Mostly in July) , the River basin get the concrete walls. 55000 People live in Bayalish Mauja, the Island of 42 villages as it was called. 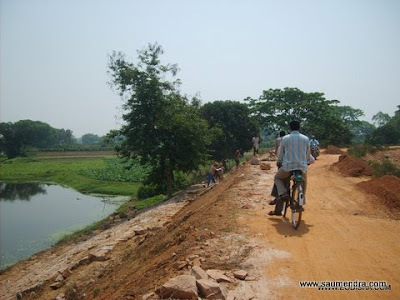 Our Village Kadampara is the hardest hit from the Floods in Monsoon. 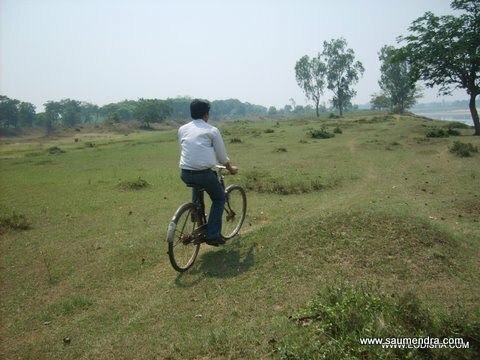 As the TECHYOG office closes at arround 9.30 am we set out for a biking to see the work on the River wall, with the bicycle ride towards , one of the most enchanting rivers of all time - The Kathajodi. 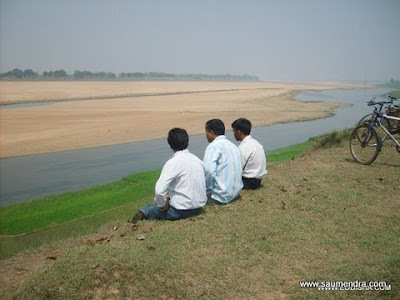 The same river makes a terrific record for being very harsh in the monsoon ( last year two youngster met with death in the river), but its one of the lively river to be watched, observe on its banks and feel the tranquil silence of water flowing through. Observing the thin steam of river water in this hot summer morning , through out the day is really worth it. I feel the best of inner self looking throgh the long steatch of dry river with the thin layer of water flowing in peace, Village farmers rowing beside its muddy water to get the best aromatic rice crop by the start of monsoon.